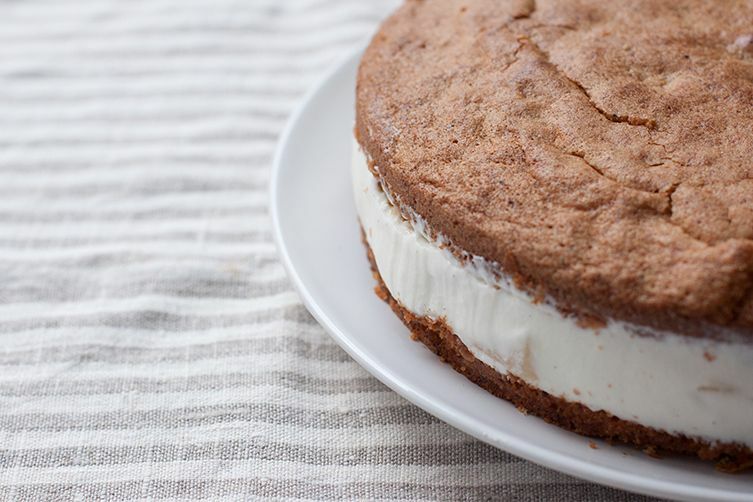 Italy's most famous dessert, tiramisu, may come from the north, but when it comes to sweets, there's no denying the Southern Italians have it in the bag. It's enough to think of Sicilian cannoli, or granita, or their famous cassata. But don't forget Campania, where Neopolitan pastry makers have mastered delights such as rum-soaked babà, deep-fried zeppole (Italian donut holes), and the most spectacular pastiera napoletana, a heavy, celebratory wheatberry and ricotta tart made only for Easter. Add to the list this pear and ricotta cake, a specialty of the Amalfi Coast, south of Naples, which I first met on Instagram while dreaming of summer holidays in Sorrento. It was invented by the Amalfi's famous pastry chef Sal De Riso at his pastry shop in the little costal town of Minori in 1998 and is a symbol of the area's bounty of local produce. 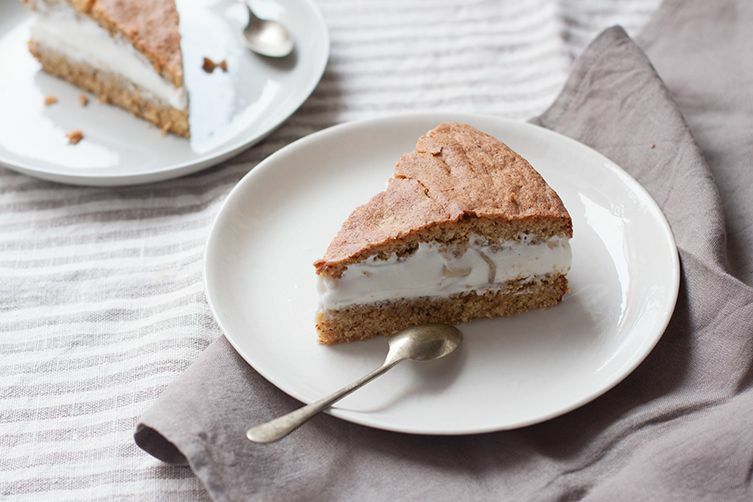 A delicious, thin sponge made with ground hazelnuts is filled with light-as-a-cloud mixture of cow's milk ricotta and whipped cream that's studded with cubes of pear cooked in syrup. It's simple but heavenly. Next to his "Delizie al limone amalfitano" (Delights of Amalfi Lemon) dessert (a lemon pastry cream-filled sponge covered in lemon sauce), the pear and ricotta cake is Sal De Riso's most requested item. This immense popularity means it has been reproduced in cafés and pastry shops all over the area; you can even find a chain version made for supermarkets, surely a sign of how much it is now considered a fixture of the local fare. As Sal De Riso himself stresses, the quality of the ingredients is key, as should be the case for any simple recipe. 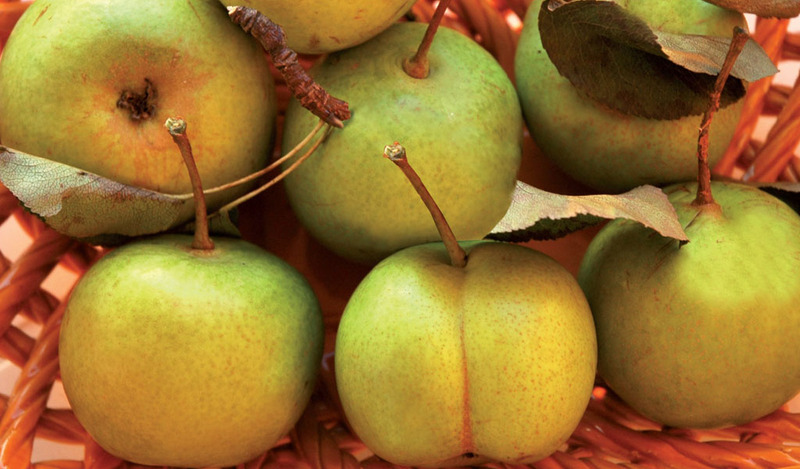 The original version is made with pears that grow in Campania known as pere pennate, which are small, green, and peach-shaped, but you can substitute with any green pear. For the hazelnut meal, you'll get the best results by blending whole, peeled hazelnuts in a food processor, but you can use packaged ground hazelnut meal if you like. 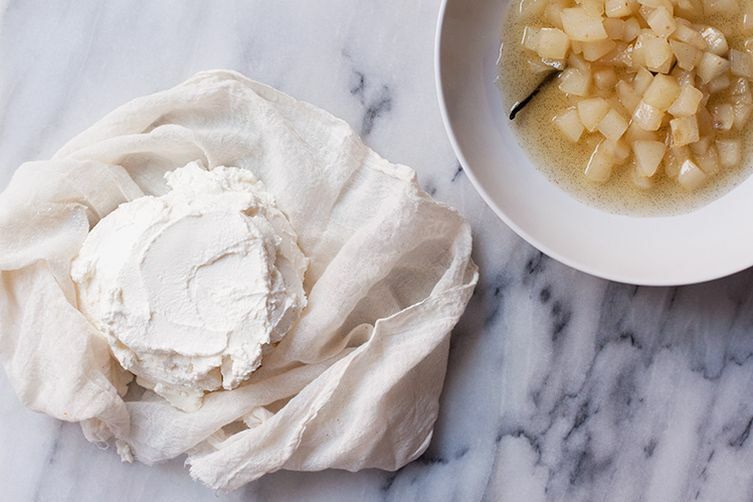 The reason for this is simply that the texture and the structure of the two types of ricotta is completely different. The ricotta that you buy from a deli by the weight is likely to be real ricotta—that is, fluffy white flecks of curd that are born out of whey during the cheese-making process. It's thick, even crumbly, and firm. The stuff in the tubs has to go through a process that makes the resulting product "squirtable," for want of a better word; it's therefore runny and somewhat grainy. For this filling, it's ideal—for flavor as well as consistency and practicality—to have a firmer ricotta. 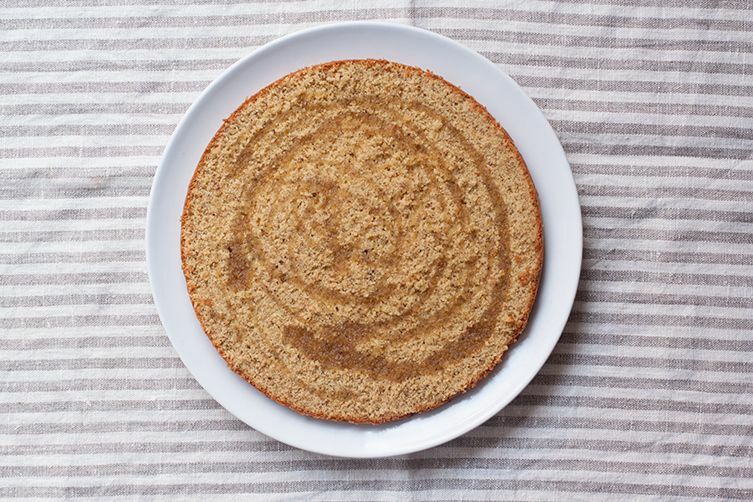 You can prepare the sponge ahead of time and you can also assemble the entire cake the day before you need it; in fact, much like tiramisu, it's better when it's had an entire day to rest in the fridge. 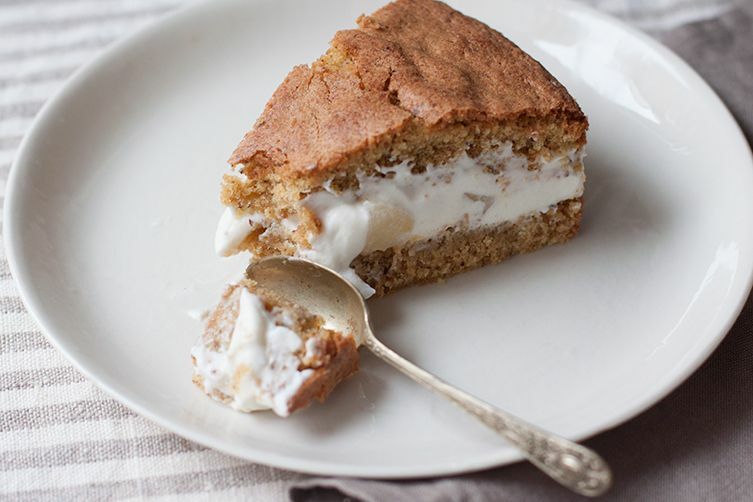 The ricotta mixture will firm up slightly, the cake will absorb the moisture and flavors of the pear syrup, and the whole dessert will slice more neatly. If you absolutely need to serve it on the day that you have made it, try chilling it in the fridge at least a couple of hours before serving. It will make slicing it a little bit easier. Loved this cake, have made it twice for friends and work. Great flavours, am thinking of making a Christmas trifle out of the filling with sponge biscuits and some sort of chocolate. Thanks for the recipe. I should say this is the first recipe I've used from this website, so very happy with the result and hoping it's a good omen. this looks insanely good. will def try!